You will be given a reference e-book to read which has 335 pages And the test will be based on that e-book , you can take final test within 1 year of purchase. An iPad refers to the line of tablet computers mainly marketed and designed by Apple and operates using its iOS operating system. This gadget comes with a user interface which surrounds its multi-touch screen as well as its virtual keyboard. It should be noted that this device also comes with a built-in Wi-Fi. There are even iPad models that come with cellular connectivity. The gadget can perform numerous functions including shooting and taking high quality videos and photos, playing music and performing activities that you can usually do online including emailing, social networking and web browsing. You can also use it for GPS navigation, as references or when playing games. Note, however, that you will need to download and install apps in order for you to enjoy all these. The good thing about this is that the App Store now offers over seven hundred thousand apps. This is extremely beneficial for you especially if you want to own an iPad and use it to perform a wide range of functions. There are a lot of things that you will definitely enjoy from owning an iPad. One of these is its Retina display. This allows you to take a look on large, clear and beautiful displays. You will also enjoy its rich color saturation and clear texts which will surely let you enjoy viewing pictures, reading articles, playing your favorite games and watching videos. You will also enjoy this gadget’s long battery life, speed and useful built-in apps. 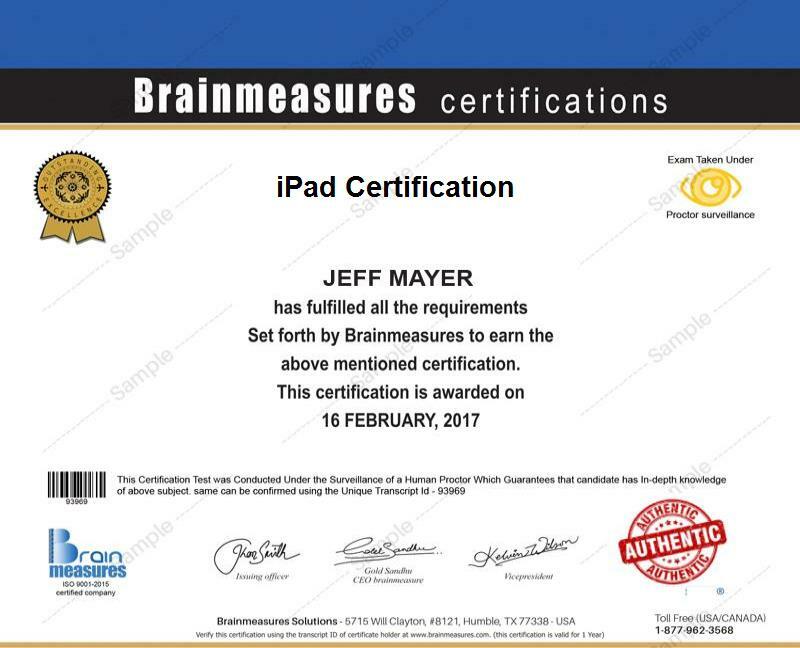 Learning everything about the different iPad models is now really possible if you participate in the iPad certification program which is now available at Brainmeasures. You will never face regrets enrolling in this iPad course from Brainmeasures because this specific online certification company is already well-recognized for its effectiveness in providing everyone who decides to enrol on its certification courses with truthful, updated and quality information. With the help of this iPad certification course from Brainmeasures, you will find it easier to undergo a well-detailed iPad training which is guaranteed to help you in familiarizing yourself about the different iPad models, how they differ from each other, the different features that are installed in various iPad models, its major functions, the best and most functional apps that you can install in this device, its major components and how you can make the most out of owning an iPad. Earning an iPad certificate is really beneficial for you because it works in showcasing your skills and expertise in using different iPad models and in properly taking care of them. How to effectively sync your gadget with iTunes, calendars, contacts, photos, music, documents and apps? You will never deal with regrets enrolling in the iPad certification program offered by Brainmeasures since it is filled with all relevant details that can help you in your attempt to become more effective in using this gadget. This program can be expected to offer more benefits to IT professionals, engineers, iPad operators, iPad app developers and anyone who wishes to learn more about all aspects related to this popular device. Your decision to complete an iPad certification course can also benefit you in terms of financial stability. The reason behind this is that you can use your iPad certification to work in profitable positions such as an iPad configuration engineer which lets you receive around $73,000 to $107,000 yearly. You can also use it to work effectively as an iPad applications developer and earn around $62,000 to $146,000 yearly from this job.